Most computers use a two-step process to cool the CPU. First, a heat exchanger pasted to the processor draws the warmth away. And then a combination of a heatsink and fans dissipate it away from the PC. 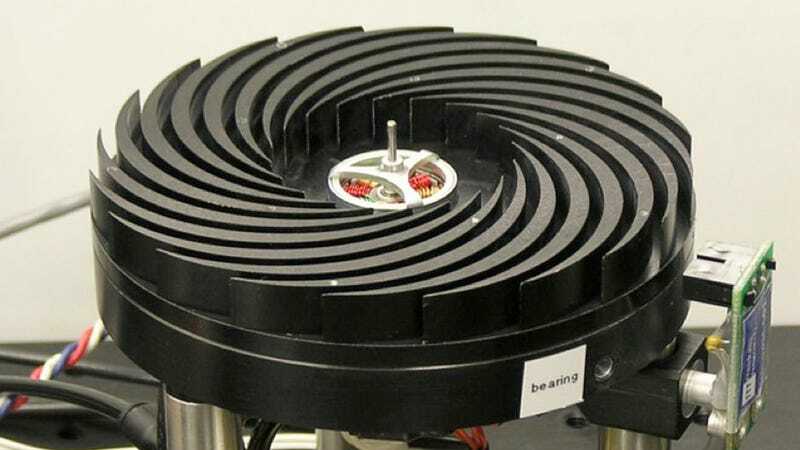 But by merging those two steps into one, this spinning cooler ends up being greater than the sum of its parts. The Sandia Cooler was developed by the Sandia National Labs who do enough research to know a thing or two about how to effectively cool a computer. The most interesting aspect of the cooler is that it doesn't attach directly to the CPU using thermal paste—which isn't possible given it's always spinning. Instead, it sits a mere thousandth of an inch above the processor, which creates what's called an air bearing that's actually just as efficient at transmitting heat. And as the heat moves from the CPU to the cooler, it's almost immediately blasted away via a series of fins spinning at 2,000 rpm. As a result, Sandia claims the system is at least 30 times more efficient at cooling a processor than traditional heatsink and fan methods.